It happens every December. I fall head over heels into the holiday season.The sight of first snow, tumbling flakes dancing across the blog page, to the real version, delights. I imagine the forgotten child who once found beauty in the simplest of gifts. A first snow evokes glorious moments, past holiday memories. I will that child’s sweet feelings of hope to return. More than the beauty of the season beckons. Yes, it’s true~ possessing a need to touch the shiny surfaces of the glass ornaments laying in shop baskets, I pause and lift one. Glitter and sparkle catch my eye. It is more than the superficial. I know that. Momentarily, I become a child again. Tip toeing through the quiet living room, wandering to the front window to gaze out, my eyes look up to the heavens. Enchanted. Nightfall blankets, a starry sky twinkling back as the first flakes tumble to earth. Beholden to a powerful spell, captivated by a belief. I know the world truly is a magical place. So long ago, a tree stood in a corner of the dimly lit room, evergreen boughs laden with twinkling lights. A soft glow illuminated the darkened room. Branches sparkled, adorned with colourful glass baubles. A shiny star graced the uppermost tip of the tree. Tinsel dripped, hung like frozen icicles from the branches. A cheap, chubby plastic Santa leaned into the base of the tree. We begged mother to buy it. Just a doll yet it looked so real. It’s so simple. A child waits for Christmas to appear. A child believes. Older now, I muse, If only it was that simple. If only wishes really did come true. 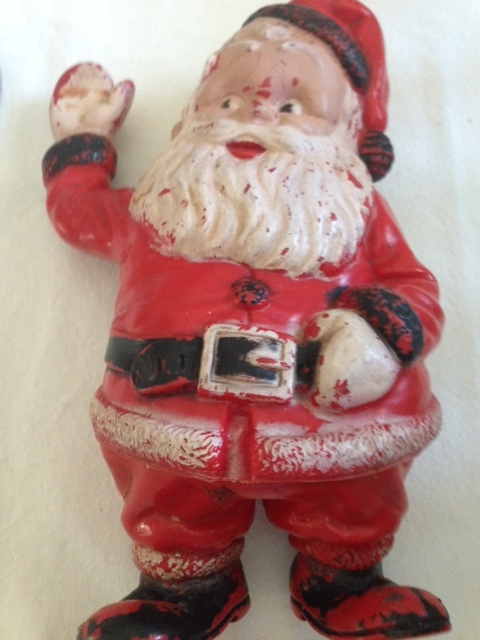 Picking the plastic Santa from the ornament box I notice the colour has faded, rubbed away. The eyes still twinkle. Sighing, I need a moment to collect myself. Sometimes memories ache. I know the world isn’t such a magical place. Poverty is real, children go hungry; they shiver in fear. Disease consumes. War and hatred rage on. Love is fleeting. Tears rain and hearts break. What we do to one, passes to another. We understand that as children. The plastic Santa remains, a child’s symbol for hope. It really is simple. Be compassionate. Show up for someone. Share friendship, exchange a hug, hold a hand. Donate to a worthy cause. Keep an open heart. Be grateful. I place the plastic Santa beneath the tree, an endearing symbol for hope.The world truly is a magical place. Believe. Those were the days _ when we believed all that fairy tale stuff. Wonderful lies. Good lies. I miss those magical days. Me, too! Our hearts were open; we believed in the seasons, our family, our friends, long summer days and ice cream. Simplistic yet powerful seeds of hope. Things can improve, there’s time to fix the broken, there’s time… Along the way we “grew up.” Christmas reminds me to find that “lost” child, dust her off, share her quiet wonder at the world and her hope, to be grateful.